Gartner has placed XtremIO solidly in the ‘Leaders’ quadrant of their inaugural All-Flash Array (or Solid State Array in Gartner parlance) Magic Quadrant. The Register leaked the Magic Quadrant and I have reprinted their image below. XtremIO got the leading part in the “leader” quadrant, I can’t say we were surprised (at least, I wasn’t) as we are seeing an increased numbers of customers joining our flash revolution and on the competitive front, we are seeing more and more customers who understand why “Architecture Matters”, since day 1, we have been very vocal about the fact that the architecture, the house foundations must be solid and that features can be added later on, we have more and more customers telling us that things like scale – out really matters to do as they need the horsepower to drive the capacity added, things like garbage collection that does not impact the array performance, user data and metadata in memory that is one of unique features of our snapshots and more and more..
so what is the tipping point you are probably asking yourself, well, we are now in phase 3 of the All-Flash based datacenter, let’s look at the phases..
this phase can be related to the period between the Direct Availability phase to the GA of the product (November 2013), customers were mainly interested in XtremIO because of it’s performance, sort of like, “I have this DB that just needs the lowest latency / highest IOPS you can give me”, I also heard comments like “I’m still not too sure about FLASH, it’s a new technology and I need to get my head around it”, all of this comments were more than fair in my eyes, XtremIO was a brand new technology and it HAD to prove itself in the field, and boy it did! this phase can be related to the period between the GA of the product to the end of Q2 in 2014, it is known as the “Application Services” phase, no longer customers saw XtremIO as a performance tier, they started to really get their heads around things like always on deduplication and the unique snapshots architecture and as such, started to migrate their DB’s + test / dev environments to XtremIO and migrated their VDI environment to XtremIO (VDI was also part of phase 1), we started to see a massive migration to our platform around this phase, but still it wasn’t a full DC migration. this phase can be related to the period between Q3 till now, we are now seeing new (and returning customers) who have been telling us, “you know what, I enjoyed using XtremIO so much, that is really hard for me to look back, can you solve my ENTIRE virtualized datacenter storage needs?”. this question is kinda tricky since the word “entire” means many things to me but it’s easy to answer after an analysis, so for example, we have now released a Mitrend XtremIO analysis tool (free!) that can scan your entire virtualized VMFS/RDM’s file systems and tell you how much capacity you will need migrating them to XtremIO, it does it while taking into considerations things like our always on deduplication / compression. this to me is that current maturity of the product, as a relatively young dad, I always think about my daughter being born, get send to the kinder garden and in the following year get sent to elementary school! no longer, a dual engine that works in Active / Passive / ALUAH (enter any other marketing terms that tries to drift you from the main idea) is sufficient, customer MUST have the horse power to drive the capacity associated, the VMware IO blender and the added VM’s needs it not only for todays workload but for the years to come, if you are building isolated silos, it’s like the 90’s all over again. it is now mandatory to have deduplication, compression, space-efficient snapshots, it also a very tricky concept because this slide can be related to many other products but like always, the devil is in the details, if your AFA throttle back deduplication / compression because of lack of horse power / Active-Passive technology (see point 1), you are missing out, XtremIO provides an ALWAYS inline data services, see why you want / need the true Active-Active + Scale Out architecture? the data services themselves are important for the “generic” virtualized use cases since it allow you to have a very good TCO for these environment’s and then you need to prove your CIO “why SHOULDN’T I go with XtremIO”? 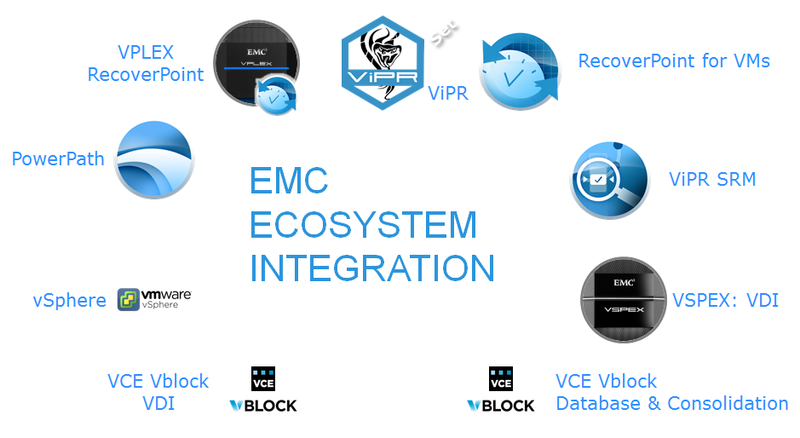 because you now want to manage your entire DC using XtremIO, it is not sufficient to have a solid architecture anymore, you need replication, you need the same monitoring tools to just work with the new platform etc etc’ and this is the strength of EMC, it was ALWAYS the strength of EMC, we don’t just sell the box, we give our customers the entire solution, for example, you can now build your DC using either a VBLOCK or a VPLEX, you can now have a true Active / Active Datacenter using VPLEX, you can now monitor your entire dc using ViPR SRM, you can now replicate your VMs using RecoverPoint for VMs (and amazing solution!) and the list goes on and on and on..
hope I was able to successfully share with you where were we and were are we now, I encourage you to tune to the Q3/2014 EMC earning results to hear more..and the best part? this is just the beginning! here’s a video demo showing virtualized workload running on a 4 X-Bricks cluster! Then came Oracle (Open World).. I just wanted to say that in 2013, larry compared whatever they had on the truck at that time to a VMAX and IBM, and in less than an year, it’s XtremIO ? what does larry know? well, it’s very common now to see XtremIO replacing exadata, customers are voting with their wallets toward an open, super easy to mange and much more performing than exadata, still , kudos for larry’s for vote of confidence. Next Post Next post: VSI 6.3 Is Here!